For many Americans, economic forecasts can seem a lot like Chicken Little, constantly screaming that the sky is falling. But for college students and recent graduates dependent on federal financial aid to fund their educations, that’s exactly what is happening. On July 1, interest rates on subsidized federal student loans doubled, adjusting from 3.4 percent to 6.8 percent overnight. That means that the already economy-busting student loan issue just got a whole lot worse. And a legislative attempt to bring the rates back down failed this week. Americans have $1.1 trillion in outstanding student loan debt, more than credit card debt or car loans. And unlike those debts, it’s nearly impossible to get out from under student loans—borrowers usually can’t discharge it in bankruptcy, refinance it or modify the loan. There’s no time limitation on collecting a student debt. In fact, students who become disabled can even have their social security payments garnished to pay off their education loans. It’s a system that Salon’s David Dayen refers to as indentured servitude—because unlike other types of loans, you literally cannot break free until you have worked off the debt. This is particularly true for students in states like Mississippi, where 54 percent of students have college loan debt and, on average, graduate with about $24,000 in student loans. With the national unemployment rate for new college graduates holding steady at around 8 percent, our best and brightest are left with a terrible choice: try to start making payments while unemployed or underemployed or go to graduate school, taking out more loans in the process. It’s a financial burden that will weigh down all sectors of the American economy. People who earned college diplomas used to be more likely to become homeowners than those without—now, college graduates with student loan debt are 36 percent less likely to own a home. They are also less likely to purchase cars or start small businesses and more likely to delay starting families. 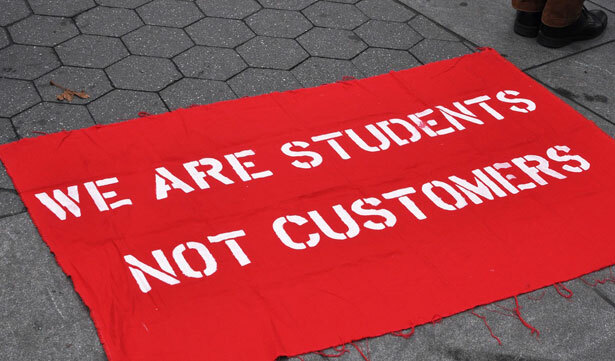 Instead of contributing to the state and national economy, those with student loans are contributing only to the narrowest of financial balance sheets—those of debt collectors and banks. Congress must address the growing student debt issue. Students aren’t takers—they have worked hard to get into college and graduate school, and have shown that they are dedicated to improving themselves and their communities. They deserve better than lifelong debt and crushing educational loan bills. Senator Elizabeth Warren has suggested allowing students to borrow from the federal government at the same rates banks can—0.75 percent. Others have discussed introducing bills allowing loans to be discharged in bankruptcy, modified or exempting Social Security from garnishment for student loan debt. While activists organize for redress and politicians bicker, many of today’s college students are worrying about how they’ll be able to pay up. Whitney BarkleyWhitney Barkley serves as a staff attorney at the Mississippi Center for Justice, where she focuses on protecting Mississippians from predatory for-profit colleges and helping high school students access affordable financial aid. Prior to joining the Center, Barkley spent summers interning at the Equal Rights Center and Lawyers' Committee for Civil Rights Under Law, where she worked on projects involving payday lending, fair housing and election protection.